WHEN: August 18, 2018 12 noon to 4 p.m. 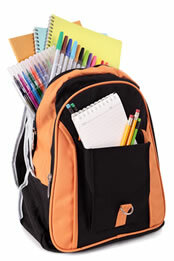 Qualifying families who meet income guidelines and live in the Loveland City School District can receive a backpack filled with school supplies for their children. Families MUST sign up students for this program. The goal of the back to school program is simple but powerful: If we can get all the resources in our community together, we can help economically disadvantaged children start off the new school year with many of their school-related needs. Our Annual Back Pack Program gives Loveland School children the chance to start the year off with NEW Backpacks and Supplies. If you can donate a filled backpack, the children would appreciate it more than you can imagine. If you are not able to complete an entire bag by yourself, please consider sharing this project with a friend. Donations are greatly appreciated! In addition to donations, we also need volunteers to help registered families, sort, pack, and distribute backpacks. We also need help with set up and managing stations for the Back to School Fair. The Loveland Initiative is a 501(c)(3) non-profit organization.